Time slows down in this laid-back city in northern Laos, which also happens to be a UNESCO World Heritage site. Luang Prabang is a cultural hot spot home to temples aplenty, French colonial architecture, and picturesque tree-lined riverbanks. This is a city known as a must-see for a reason — it really is worth your time on any visit to Southeast Asia if you’re able to build it into your itinerary. If you’re looking for some of the best things to see and do when you’re there, here are a few of your best bets. There aren’t many things more refreshing than cooling off in a cascading waterfall, and there are a few to choose from in and around Luang Prabang. One of the most majestic sets of falls has to be three-tiered Kuang Si Waterfall, located about 30 minutes outside of town. You can easily get there via tuk-tuk (but you’ll likely need to bargain for a good price). Once you arrive, there are changing facilities, picnic areas, and public toilets if you need them. Just keep in mind that swimming attire should be modest and you should only swim in marked areas. Another worthwhile waterfall to put on your see and do list is Tad Sae Waterfall, assuming you’re visiting August through November when the falls are at their most robust (you can visit Kuang Si any time). These falls are accessed via tuk-tuk and then a boat takes you the rest of the way, making for a bit of an adventure (but a safe one as this is a popular spot among both locals and visitors). 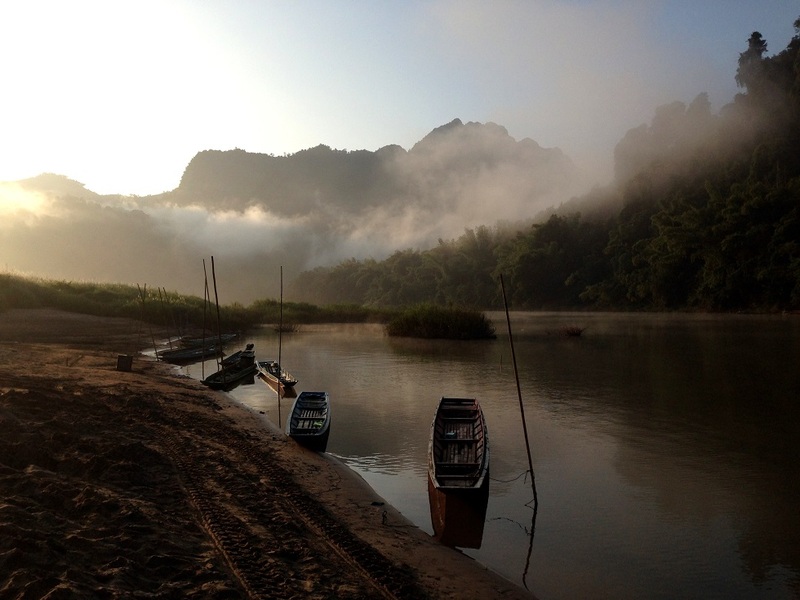 As popular a Southeast Asian destination as Luang Prabang is, it never feels overwhelming. But if you’re really looking for something that feels calm and quiet amid local life, then it’s well worth paying a visit to the morning market. The market street is filled with locals doing their shopping in the morning right after the alms giving (if you arrive before 7am you might catch sight of some monks). As you wander you’ll see piles of colourful produce, as well as meat, fish, spices, and some traditional handicrafts. Luang Prabang offers many things to many visitors, but you can’t visit without spending some of your trip in the utterly charming ancient city. Take your time and simply enjoy the slow pace as you walk the winding streets and alleys. There’s something to see around every corner, be it a monk walking to or from a temple, or a cute café perfect for an afternoon sipping iced coffees. Looking for somewhere to snap the perfect selfie? We suggest doing it in a spot where you can also include some 360 degree views over Luang Prabang. Mount Phu Si isn’t actually a mountain, but rather a large hill that rises over 100 metres above the centre of town. Sunset fans take note — this is a great spot to watch the sun go down so long as the 300+ stairs leading to the top don’t deter you. There is not shortage of temples to explore in Luang Prabang. In fact, the compact town centre is home to 34 UNESCO-protected wats that hum with life as the novices and monks within go about their daily rituals. If you’re planning to visit, remember that both men and women should have their shoulders and knees covered and to remove your shoes before entering. An ancient town and one of the prettiest spots in Southeast Asia, Luang Prabang is a destination worth exploring when you’re in this corner of the globe. Take in some Laotian culture, sail along the Mekong, explore the UNESCO heritage sites, or hop on a tour that will take you to the heart of local life in Luang Prabang!